You can’t call it a comeback because we’ve never been here before. 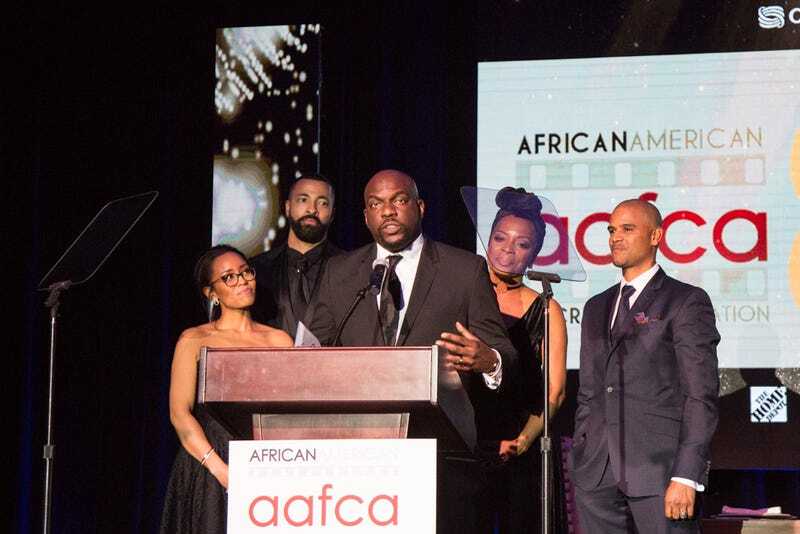 To paraphrase actor Omar Dorsey, aka “Hollywood” from the TV show Queen Sugar, at Wednesday night’s African American Film Critics Association Awards, you can’t call it a rebirth because this is something in its infancy. What Dorsey was referring to is this present age of black film and television being honored all around us, from the Golden Globes to the coming Oscar stage. This age was recognized in Los Angeles on Wednesday at the eighth annual AAFCA Awards, where Janelle Monáe was honored for her breakout performances and Moonlight took top honors for best picture and best director. There were a lot of things not to like about 2016, the year in which both Prince and democracy died, but television shows and films, particularly those helmed by or starring black artists, were not among them. No longer a glistening token like The Cosby Show or reduced to the margins of fledgling, failing TV networks like UPN and the WB, black film and TV became mainstream in 2016, even at times dominating the entertainment landscape with titans like Oprah Winfrey, Ava DuVernay, Tyler Perry, Shonda Rhimes and Lee Daniels lending their cred, names and talents to marquee programming. In 2016, black art became less and less the exception as it made its own rules, saturating our screens—big and small—in vibrant color. This was the first year in my recent memory where there was literally so much black art to watch, I’m still getting caught up. Sure, I devoured all of Queen Sugar, Atlanta, Luke Cage and Insecure; binge-watched a deeply compelling Thandie Newton in the brilliant Westworld on HBO; and saw a preview of Fences before it hit theaters, but I still haven’t made my way around to Hidden Figures, Queen of Katwe, Greenleaf, Black-ish, The Get Down or even the latest season of Empire. Because the new age of black TV and film had arrived, and everyone in the room at AAFCA made it happen together. Actor Lou Diamond Phillips, who was a presenter at the awards, briefly recounted a story of him thanking AAFCA Icon Award winner Sidney Poitier for making it possible for men of color to take on leading roles in films. Phillips credited Poitier with making his career a reality, but said that Poitier told him that Phillips had succeeded simply because he was a great actor. Director Barry Jenkins of Oscar-nominated Moonlight talked about how, after making the film Medicine for the Melancholy in 2008, it took him eight years to do anything else, and thanked his management team for standing by him while he found his way. And onstage, actress Sheryl Lee Ralph recalled how director-producer Lee Daniels once slept on her couch when he was homeless. “She didn’t know I was her stalker,” Daniels said as he was honored at the AAFCA Awards with the 2017 Cinema Vanguard Award. A video clip revealed that Daniels, as a young man, had sneaked out of the house to see a performance of the hit Broadway musical Dreamgirls, starring a young Ralph. Probably one of the most deeply affecting moments during the awards ceremony was when acclaimed director John Singleton (Boyz n the Hood, Baby Boy) could barely mask his pride and admiration for a man he admitted he hadn’t met, but felt he knew through his art: fellow director Barry Jenkins, the auteur behind independent film Moonlight. Singleton was presenting an award to Jenkins for Moonlight. Jenkins, in turn, thanked Singleton for inspiring him through his work on Boyz n the Hood, Singleton’s first, groundbreaking film. While we have entered a new, and hopefully lasting, stage in black TV and cinema, this doesn’t make awards like the AAFCA any less relevant. The fact that we have this moment is to the credit of organizations like AAFCA and the many talented people who filled the room that night, honoring and celebrating one another. It is through our shared strength and talent that we find the ability to overcome the obstacles set against us. It is through our commonality and camaraderie that we grow and manifest our dreams. Let us continue to love and celebrate one another—both through times of struggle and in this shining moment of celebration.